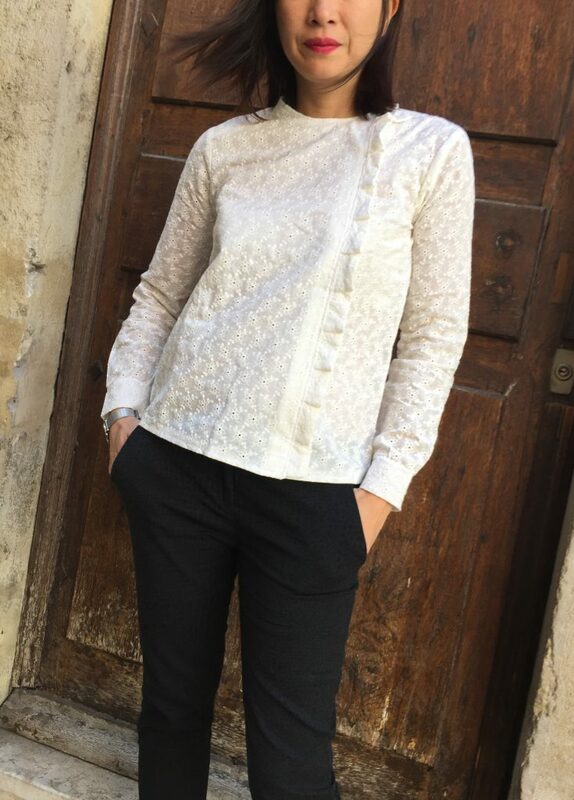 On termine la folle semaine « Dentelle & Broderie » en beauté ;)) Nous avons choisi Scarlett, la dernière blouse by Laboratoire familial…Un gros gros coup de coeur !!! Apres Eleonore et Sixtine, Ophelie alias Laboratoire Familial vient de lancer une sublimissssime collection so chic so chic ! C’est une pure merveille en effet si vous êtes à la recherche de modèles pour de grandes occasions vous serez conquise !!! Pour l’inaugurer, j’ai choisi la blouse Scarlett pour son style et surtout le détail chic du volant agrémenté de plis. Je l’aime tellement que j’ai eu envie de partager 2 versions 100% broderie avec deux styles différents 🙂 En effet, l’une reflet pour un style sage avec la sublime broderie fleurs by Printstand et l’autre plus originale associée avec une broderie géométrique argent by Printstand unique en son genre. Le choix de ces tissus m’a paru idéal pour m’amuser avec la superposition des plis et l’effet « suggéré » lié à la transparence, particulièrement sur la broderie géométrique argent. Vous commencerez par monter les 2 devants et dos ensemble aux épaules. Il sera désormais temps de réaliser les plis à l’aide de la bande préalablement cousue endroit sur endroit et sur les largeurs haut et bas. Bien cranter et passer la centrale vapeur. Une fois la bande superposée vous allez réaliser les plis à équi distance en prenant soin de laisser 1 cm au col et idem en bas de la blouse puis une fois vos plis bien maintenus vous n’aurez plus qu’à coudre le volant à plis. Puis vous allez monter les parementures des 2 devants ainsi votre volant à plis sera donc pris en sandwich entre la parementure et le devant principal. Je vous invite à surpiquer tout autour du col.
Il vous restera à réaliser les manches en commencant par monter les manches puis une fois posées vous viendrez coudre les côtés. Ainsi vous effectuerez les bords de manche puis vous allez les coudre sur les manches montées. 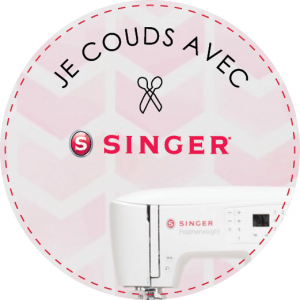 Pour éviter de surcharger la blouse Scarlett, j’ai décidé de la réaliser sans boutonnière ainsi j’ai superposé le devant principal à l’autre partie devant et laissé un espace de 15 cm, suffisamment confortable pour passer ma tête. 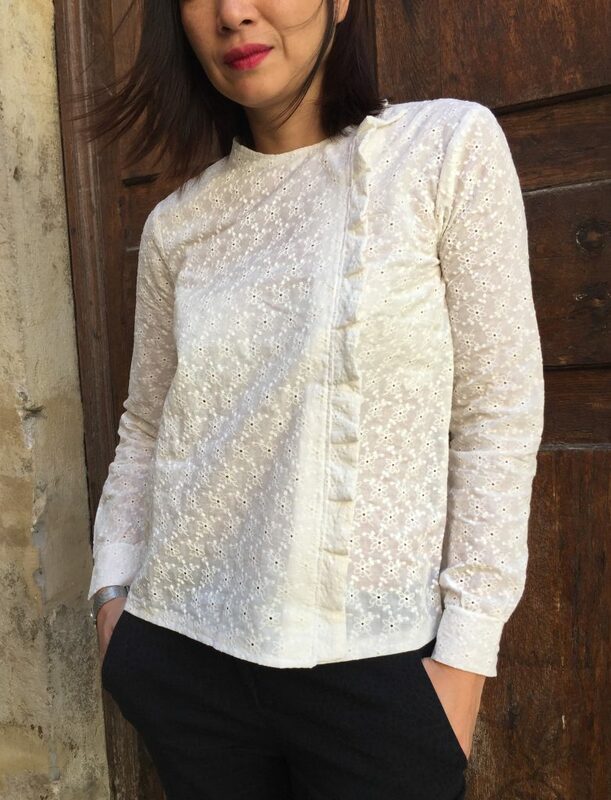 Et j’ai cousu du bas jusqu’au repère de 15cm puis posé un bouton pression invisible en prenant soin de bien aligner au col.
We finished the crazy week « Lace & Embroidery » in beauty;)) We chose Scarlett, the last blouse by Laboratoire familial … A big blow of heart !!! After Eleonore and Sixtine, Ophelie alias Laboratoire Familial has launched a sublimissssime collection so chic so chic! It is a pure wonder indeed if you are looking for models for great occasions you will be conquered !!! To inaugurate it, I chose the Scarlett blouse for its style and especially the chic detail of the steering wheel decorated with folds. I love it so much that I wanted to share 2 versions 100% embroidery with two different styles 🙂 Indeed, one reflection for a wise style with the sublime embroidery flowers by Printstand and the other more original associated with A unique silver geometric embroidery by Printstand. The choice of these fabrics seemed to me ideal to amuse me with the superimposition of the folds and the « suggested » effect related to transparency, especially on silver geometric embroidery. 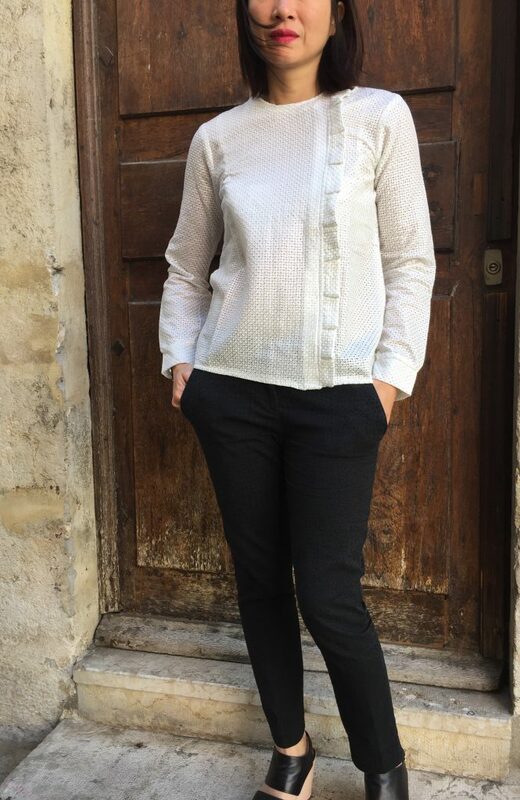 In the beginning, the Scarlett by Laboratoire familial blouse can be declined in different fabrics: cotton, viscose, crepe, … For this first, the two fabrics remain a pleasure to sew despite the relief including the mounting of the superimposed folds. I chose to make the Scarlett blouse without buttonhole to avoid overloading it taking into account the chosen fabrics. So I found a trick that I will deliver you further. You will start by going up the 2 fronts and back together to the shoulders. It will now be time to realize the folds using the previously sewn strip on location and on the top and bottom widths. Screw the steam generator well. 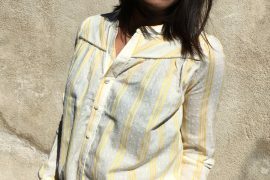 Once the strip is superimposed you will realize the folds at equi distance taking care to leave 1 cm at the collar and ditto at the bottom of the blouse and then once your folds are well maintained you will have only to sew the pleated steering wheel. Then you will mount the facing of the 2 fronts so your fold steering wheel will be sandwiched between the facing and the front main. I invite you to stitch all around the collar. You will have to make the sleeves by starting with the sleeves and then, once you have placed them, you will have to sew the sides. So you will make the edges of the sleeve then you will sew them on the sleeves mounted. To avoid overloading the Scarlett blouse, I decided to make it without a buttonhole so I superimposed the main front to the other part in front and left a space of 15 cm, comfortable enough to pass my head. And I sewed from the bottom to the mark of 15cm then put a button invisible pressure taking care to align well with the collar.